Pluto's Haze: This image of haze layers above Pluto's limb was taken by the Ralph/Multispectral Visible Imaging Camera (MVIC) on NASA's New Horizons spacecraft. About 20 haze layers are seen; the layers have been found to typically extend horizontally over hundreds of kilometers, but are not strictly parallel to the surface. For example, white arrows indicate a haze layer about three miles (five kilometers) above the surface on the left, which has descended to the surface at the right. A year ago, Pluto was just a bright speck in the cameras of NASA's approaching New Horizons spacecraft, not much different than its appearances in telescopes since Clyde Tombaugh discovered the ninth planet in 1930. But this week, in the journal Science, New Horizons scientists published the first comprehensive set of papers describing results from last summer's Pluto system flyby. "These five detailed papers completely transform our view of Pluto – revealing the former 'astronomer's planet' to be a real world with diverse and active geology, exotic surface chemistry, a complex atmosphere, puzzling interaction with the sun and an intriguing system of small moons," said Alan Stern, New Horizons principal investigator from Southwest Research Institute, Boulder, Colorado. After a 9.5-year, 3-billion-mile journey – launching faster and traveling farther than any spacecraft to reach its primary target – New Horizons zipped by Pluto on July 14, 2015. New Horizons' seven science instruments collected about 50 gigabits of data on the spacecraft's digital recorders, most of it coming over nine busy days surrounding the encounter. About half of that data has now been transmitted home – from distances where radio signals at light speed need nearly five hours to reach Earth – with all of it expected back by October. The first close-up pictures revealed a large heart-shaped feature carved into Pluto's surface, telling scientists that this "new" type of planet – the largest, brightest and first-explored in the mysterious, distant "third zone" of our solar system known as the Kuiper Belt – would be even more interesting and puzzling than models predicted. Mountains, Craters and Plains: Above are New Horizons views of the informally named Sputnik Planum on Pluto (top) and the informally named Vulcan Planum on Charon (bottom). Both scale bars measure 20 miles (32 kilometers) long; illumination is from the left in both instances. The Sputnik Planum view is centered at 11°N, 180°E, and covers the bright, icy, geologically cellular plains. Here, the cells are defined by a network of interconnected troughs that crisscross these nitrogen-ice plains. 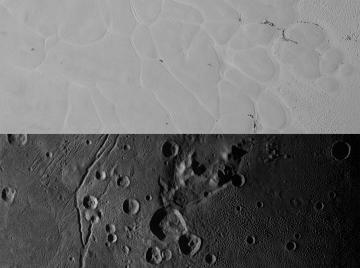 At right, in the upper image, the cellular plains yield to pitted plains of southern Sputnik Planum. This observation was obtained by the Ralph/Multispectral Visible Imaging Camera (MVIC) at a resolution of 1,050 feet (320 meters) per pixel. The Vulcan Planum view in the bottom panel is centered at 4°S, 4°E, and includes the "moated mountain" Clarke Mons just above the center of the image. As well as featuring impact craters and sinuous troughs, the water ice-rich plains display a range of surface textures, from smooth and grooved at left, to pitted and hummocky at right. This observation was obtained by the Long Range Reconnaissance Imager (LORRI) at a resolution of 525 feet (160 meters) per pixel. The newly published Science papers bear that out; click here for a list of nine of the top results from the papers. Age-dating of Pluto's surface through crater counts has revealed that Pluto has been geologically active throughout the past 4 billion years. Further, the surface of Pluto's informally named Sputnik Planum, a massive ice plain larger than Texas, is devoid of any detectable craters and estimated to be geologically young – no more than 10 million years old. Pluto's moon Charon has been discovered to have an ancient surface. As an example, the great equatorial expanse of smooth plains on Charon informally named Vulcan Planum (home of the "moated mountains" informally named Kubrick and Clarke Mons) is likely a vast cryovolcanic flow or flows that erupted onto Charon's surface about 4 billion years ago. These flows are likely related to the freezing of an internal ocean that globally ruptured Charon's crust. The distribution of compositional units on Pluto's surface – from nitrogen-rich, to methane-rich, to water-rich – has been found to be surprisingly complex, creating puzzles for understanding Pluto's climate and geologic history. The strong differences found in surface composition from place to place on Pluto are unprecedented elsewhere in the outer solar system. Pluto's upper atmospheric temperature has been found to be much colder (by about 70 degrees Fahrenheit) than had been thought from Earth-based studies, with important implications for its atmospheric escape rate. Why the atmosphere is colder is a mystery. Composition profiles for numerous important species in Pluto's atmosphere (including molecular nitrogen, methane, acetylene, ethylene and ethane) have been measured as a function of altitude for the first time. Also for the first time, a plausible mechanism for forming Pluto's atmospheric haze layers has been found; this mechanism involves the concentration of haze particles by atmospheric buoyancy waves (called "gravity waves" by atmospheric scientists), created by winds blowing over Pluto's mountainous topography. Before the flyby, the presence of Pluto's four small moons raised concerns about debris hazards in the system. But the Venetia Burney Student Dust Counter only counted a single dust particle within 5 days of the flyby. This is similar to the density of dust particles in free space in the outer solar system – about 6 particles per cubic mile – showing that the region around Pluto is in fact not filled with debris. New Horizons' charged-particle instruments revealed that the interaction region between the solar wind and Pluto's atmosphere is confined on the dayside of Pluto to within 6 Pluto radii, about 4,500 miles (7,000 kilometers). This is much smaller than expected before the flyby, and is likely due to the reduced atmospheric escape rate found from modeling of ultraviolet atmospheric occultation data. The high albedos (reflectiveness) of Pluto's small satellites are entirely different from the much lower albedos of the small bodies in the general Kuiper Belt population (which range from about 5 to 20 percent). This difference lends further support to the idea that these satellites were not captured from the general Kuiper Belt population, but instead formed by agglomeration in a disk of material produced in the aftermath of the giant collision that created the entire Pluto satellite system. "Observing Pluto and Charon up close has caused us to completely reassess thinking on what sort of geological activity can be sustained on isolated planetary bodies in this distant region of the solar system, worlds that formerly had been thought to be relics little changed since the Kuiper Belt's formation," said Jeff Moore, from NASA Ames Research Center, California, and lead author of the paper covering geology. Surface Diversity: This enhanced color view of Pluto's surface diversity was created by merging Ralph/Multispectral Visible Imaging Camera (MVIC) color imagery (650 meters per pixel) with Long Range Reconnaissance Imager panchromatic imagery (230 meters per pixel). At lower right, ancient, heavily cratered terrain is coated with dark, reddish tholins. At upper right, volatile ices filling the informally named Sputnik Planum have modified the surface, creating a chaos-like array of blocky mountains. Volatile ice also occupies a few nearby deep craters, and in some areas the volatile ice is pocked with arrays of small sublimation pits. At left, and across the bottom of the scene, gray-white CH4 ice deposits modify tectonic ridges, the rims of craters, and north-facing slopes. The scene in this image is 260 miles (420 kilometers) wide and 140 miles (225 kilometers) from top to bottom; north is to the upper left. Scientists studying Pluto's composition say the diversity of the planet's landscape stems from eons of interaction between highly volatile and mobile methane, nitrogen and carbon monoxide ices with inert and sturdy water ice. "We see variations in the distribution of Pluto's volatile ices that point to fascinating cycles of evaporation and condensation," said Will Grundy, from Lowell Observatory in Flagstaff, Arizona, and lead author of the composition paper. "These cycles are a lot richer than on Earth, where there's really only one material that condenses and evaporates – water. On Pluto, there are least three materials, and while they interact in ways we don't yet fully understand, we definitely see their effects all across Pluto's surface." Above the surface, scientists discovered Pluto's atmosphere contains layered hazes, and is both cooler and more compact than expected. This affects how Pluto's upper atmosphere is lost to space, and how it interacts with the stream of charged particles from the sun known as the solar wind. "We've discovered that pre-New Horizons estimates wildly overestimated the loss of material from Pluto's atmosphere," said Fran Bagenal, from the University of Colorado, Boulder, and lead author on the particles and plasma paper. "The thought was that Pluto's atmosphere was escaping like a comet, but it is actually escaping at a rate much more like Earth's atmosphere." Randy Gladstone, of SwRI, San Antonio, and the lead author of the Science paper on atmospheric findings, added, "We've also discovered that methane, rather than nitrogen, is Pluto's primary escaping gas. This is pretty surprising, since near Pluto's surface the atmosphere is more than 99-percent nitrogen." Scientists are also analyzing the first close-up images of Pluto's small moons Styx, Nix, Kerberos, and Hydra. Discovered between 2005 and 2012, the four moons range in diameter from about 25 miles (40 kilometers) for Nix and Hydra to about six miles (10 kilometers) for Styx and Kerberos. Mission scientists further observed that the small satellites have highly anomalous rotation rates and uniformly unusual pole orientations, as well as icy surfaces with brightness and colors distinctly different from those of Pluto and Charon. They've also found evidence that some of the moons resulted from mergers of even smaller bodies, and that their surface ages date back at least 4 billion years. "These latter two results reinforce the hypothesis that the small moons formed in the aftermath of a collision that produced the Pluto-Charon binary system," said Hal Weaver, New Horizons project scientist from the Johns Hopkins University Applied Physics Laboratory in Laurel, Maryland, and lead author of the Science paper on Pluto's small moons. "This is why we explore," said Curt Niebur, New Horizons program scientist at NASA Headquarters in Washington. "The many discoveries from New Horizons represent the best of humankind and inspire us to continue the journey of exploration to the solar system and beyond."